The news that the Transportation Security Administration violated the Privacy Act by collecting data on 250,000 Americans as part of a "study" for its new "Secure Flight" program is the latest in a string of incidents detailing how government agencies are using commercial data brokers to sidestep privacy laws, setting the stage for more problems in the future. The Government Accountability Office (GAO) issued a report to Congress stating that "a TSA contractor, acting on behalf of the agency, collected more than 100 million commercial data records containing personal information such as name, date of birth, and telephone number without informing the public." Although the contractor is not identified in the GAO report or the TSA's admission that it collected the data after promising not to do so, the scandal bears a striking resemblance to the JetBlue incident, wherein the data clearinghouse Acxiomsold thousands of its data records to another TSA contractor in order to test the reliability of "CAPPS II," the predecessor to the "Secure Flight" screening system. Several laws mandating the creation of nationwide requirements for issuing state driver's licenses may require the usage of commercial data brokers such as ChoicePoint and LexisNexis to effectively implement. This has aroused concerns among privacy advocates and opponents of the "Real ID" Act who believe that entrusting such a complex enterprise to companies that have already proven incapable of protecting the data they collect may lead to even more instances of identity theft. The "Real ID" Act was passed in May 2005, attached to a bill authorizing funding for U.S. forces in Iraq. The act requires state governments to establish "minimum security standards" for issuing or re-issuing driver's licenses, including verification of Social Security Numbers and birth certificates. The law is an "unfunded mandate," meaning that states will have to come up with the money to implement the new procedures themselves, which may lead to private data screening agencies offering technology and information databases to aid in the law's enforcement. The Senate passed the Transportation Security Improvement Act as part of an extensive highway spending bill, on May 17th. The bill includes language authorizing the TSA to mandate that state motor vehicle authorities conduct background checks as "stringent" as Federal background checks for commercial driver's licenses. The bill is currently being reconciled in joint Congressional committee. Opponents of these provisions maintain that additional security requirements are not only burdensome to implement and unnecessarily invasive, but offer a dangerous opportunity for "information broker" companies to hoard even more data. Timothy Sparapani, associate legal counsel for the American Civil Liberties Union ), told The Washington Post that he "worried about the government expanding their use of background checks." Although none of the major commercial data brokers have publicly admitted to lobbying for these laws, they also have been embroiled in recent scandals and may be actively looking for more government business. ChoicePoint's loss of over 100,000 individual records to identity thieves in February 2005 opened the door to a flood of reports of identity theft and data loss. LexisNexis lost 32,000 data records to thieves in March 2005. Acxiom itself was ahead of the identity-theft curve, as its servers were hacked by employees not once, but twice - first in March 2003 and again in July 2004. Both times, millions of aggregated data records were stolen and put up for sale on the "gray market" of identity theft rings. A group of patients who once took the antidepressant drug Prozac accuse the Food and Drug Administration of covering up the drugs dangerous side effects for 14 years. As a result, they say hundreds of people have become victims of murder and suicide. Bonnie Leitsch, founder of "Prozac Survivors Support Group," and Dr. Ann Blake Tracy, founder of the International Coalition for Drug Awareness, are calling for immediate federal action to warn the public that antidepressants not only can induce suicide in adult patients -- but also acts of violence. They point to 30-year-old Indiana mother Magdalena Lopez, who last week was charged with murdering her two young sons. Lopez, they maintain, had been taking an antidepressant. In June, the FDA issued its second warning that adults taking antidepressants should be monitored for suicidal ideation and worsening depression. Leitsch says that it is unconscionable that new mothers are being prescribed drugs that have been known to induce psychosis, violence and suicide for more than a decade. "In 1991, there was evidence of 500 deaths associated with antidepressants presented to an FDA Psychopharmacological Drugs Advisory Committee hearing investigating Prozac," Leitsch said. "The failure to issue the warning has led to more suicides, homicides, school shooters and mothers killing their own children." PSSG says it has the original film footage from the 1991 FDA hearings, where dozens of testimonies were given by family members of those who had either killed themselves, or loved ones, or individuals who had attempted suicide which they directly attributed to taking an antidepressant. The group has lined up a number of health professionals who support their position on Prozac and other antidepressants. "These are extremely dangerous drugs that should have been banned, as similar drugs were in the past. Federal investigations into the violence-inducing effects of these drugs are long overdue," Tracy said. Tracy has been an outspoken critic of SSRI antidepressant drugs and has testified as an expert witness in numerous court cases involving such drugs. "The scientific evidence behind this has been out there for decades. All anyone ever had to do was read it," she says. • Annie Mae Haskew smothered her 10-week-old son in October of 2002. Before the murder she had been diagnosed with postpartum depression and had been taking antidepressants. • Andrea Yates drowned her five children, aged 6 months to 7 years in the family bathtub on Nov. 22, 2004, while taking two antidepressants Effexor and Remeron, both had been given at maximum dose. • Dena Schlosser killed her 10-month-old infant daughter in November 2004 by severing her baby's arms. She had been diagnosed with postpartum depression, hospitalized and prescribed psychiatric "medication for depression" before the crime. • Mary Ellen Moffitt suffocated her 5-week-old daughter and herself July 26, 2004. Before this she had been diagnosed with postpartum depression and had been taking the antidepressant Paxil. • Emiri Padron smothered her baby daughter in her crib on June 22, 2004 and then stabbed herself twice in the chest. Emiri was receiving psychiatric treatment before the incident and investigators found the antidepressant Zoloft in the apartment where the crime took place. • Mine Ener used a kitchen knife to cut the throat of her 6-month-old daughter on Aug. 4, 2003, after being diagnosed with postpartum depression and taking "medication" for the condition. Leitsch says that the FDA's claim that it could take a year to review the suicide adverse effects of antidepressant drugs is negligent. "They must warn the public that not only can the drugs include suicide -- but heinous acts of violence -- mothers killing their own children, or children killing other children, she said. Late last year FDA directed manufacturers to add a "black box" warning to the health professional labeling of all antidepressant medications to describe this risk of suicide in children, and emphasize the need for close monitoring of patients started on these medications. FDA has also determined that a Patient Medication Guide, which will be given to patients receiving the drugs to advise them of the risk and precautions that can be taken, is appropriate, and is in the process of developing one. According to Lietsch, 36 million Americans are taking the antidepressant drugs. Engine manufacturers must install computer systems on big-rig trucks operating in California to diagnose and warn drivers of emission problems, according to an order issued by state air quality regulators. The decision by the California Air Resources Board is the first such regulation in the United States for heavy-duty trucks. The California measure is likely to encourage the U.S. Environmental Protection Agency to approve a similar rule. There are an estimated 1 million to 1.5 million big-rig trucks traveling on California highways, each emitting more than 5 pounds of nitrogen oxide a day, the main ingredient of smog. A diagnostic plan would cost approximately $130 per truck. The standards would be phased in for big-rig engines beginning in 2010 and fully implemented in the 2013 model year. The New York City Department of Consumer Affairs (DCA) has filed suit in New York Supreme Court against three major wireless companies for pitching cell phones and services in deceptive advertisements that misled consumers. The suit against Nextel Communications Inc., Sprint Spectrum L.P., and T-Mobile USA Inc. seeks maximum fines and compliance with New York City's landmark Consumer Protection Law. "You can't promise a great deal in the headline and hide the true costs in the fine print," said DCA Acting Commissioner Jonathan Mintz. "If a cell phone company promises free long distance, consumers should get free long distance - period." "Consumers rely on advertising as a shortcut through the often-confusing maze of wireless options" he said, "and the City's law provides protection to ensure those ads are truthful." "While clamoring for competitive consumer attention, these major cell phone companies crossed the clear line between promotional gimmicks and deceptive advertising. It doesn't matter whether the business is selling cars, tax services, or cell phones, everyone has to follow the same rules," Mintz said. The DCA also pursued claims against AT&T; Wireless (since acquired by Cingular Wireless LLC), Cingular Wireless, and Verizon Wireless for deceptive advertising, but those companies settled and agreed to fully comply with the New York City Consumer Protection Law in their marketing. Mintz noted, "Verizon led the industry in committing to comply with the Consumer Protection Law and settling claims, and we are pleased that others followed." The DCA intensified monitoring the wireless industry advertisements in the fall of 2003 as part of a joint effort with the New York City Department of Information Technology and Telecommunications (DoITT) to track industry practices and cell phone service citywide. After months of monitoring company ads, and despite numerous discussions with company representatives to correct and clarify the ads, DCA found the companies to be in violation of city law. According to Consumers Union, information obtained from the Federal Communications Commission shows complaints filed about wireless phone service increased nearly 38% from 2003 to 2004, with cell phone marketing nearing the top of the list, and billing problems receiving the most complaints. The New York City Consumer Protection Law broadly defines deceptive and unfair trade practices, in part, by requiring the type size used in print ads to be clear and conspicuous to the reader. It prohibits practices that have the capacity, tendency, or effect of deceiving or misleading consumers.  Nextel deceived consumers by advertising "ALL INCOMING CALLS ARE FREE" when in fact, a tiny, multi-line footnote at the bottom of the advertisement indicated "...an additional access charge of either $.10 per minute multiplied by the number of participants on the call...or a monthly flat fee," would be charged to the consumer if he or she signed up for the advertised calling plan.  Nextel further deceived consumers by advertising "PLANS STARTING AT $10 PER MONTH," or "POWERFUL PHONES STARTING AT $24.99" without clearly describing different service plans or products, and without adequately disclosing either the highest price of the advertised plan, or an "average price," as required by law.  Sprint deceived consumers by advertising "NATIONWIDE LONG DISTANCE INCLUDED. EVERY MINUTE, EVERY DAY" when in fact, a tiny, multi-line footnote at the bottom of the advertisement indicated a charge for long distance -- including the phrase "...an additional $0.25 per minute for long distance."  Sprint further deceived consumers by advertising that "instant savings require in-store purchase and activation of a new line..." when a tiny footnote at the bottom of the advertisement stated "Requires in-store purchase and activation of two new lines of service on eligible plans."  In the same ad, Sprint deceived consumers by advertising a "FREE" cell phone offer forcing consumers to look at the fine print footnote to find that in fact, the offer required "...a two-year Sprint PCS Advantage Agreement."  T-Mobile deceived consumers by advertising "FREE LONG DISTANCE" and "FREE ROAMING" when in fact, a tiny, multi-line footnote at the bottom of the advertisement indicated, "Billing of roaming charges and minutes of use and services may be delayed" and "Call duration may be limited." In Sweden, just one beer or glass of wine can land a driver in jail for up to six months. So when Volvo asked the Swedish government to waive the country's strict drunken driving laws to allow its test drivers to imbibe on the job, people noticed. Volvo is in the midst of testing a new technology designed to allow a car to take control of steering when a driver's reaction time is slowed because of intoxication or fatigue. The new safety system is still at the development stage and the company will not provide additional details other than to say its all about preventing accidents. If the request is granted, it would be the first exception to Sweden's drunk driving laws, which are among the world's toughest, the Swedish national broadcaster SVT reported. The company promises to only allow its drunk drivers to take the wheel on a Volvo test track near the west coast city of Gothenburg if the Swedish government grants permission. The special track is also the location of a Ford Motor Co. safety development facility. Ford owns Volvo. Sweden has one of the best road-safety records in the world in part because of its drunk driving laws. The laws apply to private and public roads. According to Stockholm Traffic Police, the most drivers could drink without risking a heavy fine is one beer. Drivers caught well over the limit can be sent to prison. If you're one of those unfortunate souls who've found unauthorized charges on your credit card from programs like AutoAdvantage - a "trial offer" that ends up being billed to your account repeatedly without your consent - then you may already be at least familiar with Trilegiant. The Norwalk, Connecticut-based direct marketing firm has found itself the target of a lawsuit brought by the California Attorney General's office. The suit alleges that Trilegiant, along with Chase Bank, deceived hundreds of California consumers through fraudulent billing practices designed to confuse them into signing up for unwanted services. Besides its "services," Trilegiant is heavily involved in the loyalty program industry, through its Trilegiant Loyalty Solutions division, based in Richmond, Virginia. The company's Web site boasts of selling its "Loyalty" as a product, with "25 billion [gift card] points redeemed since 2004 alone." Trilegiant is an offshoot, subsidiary or affiliate (it's hard to tell which) of the Cendant corporation, a major player in the travel and real estate markets, and also involved in national security via the failed "CAPPS II" airline passenger identification system. Travel offers, loyalty cards, airline fares - Trilegiant seems to be everywhere. And as is often the case, there is far too little in the way of public disclosure of what this company is actually doing with the information it collects. Trilegiant, to the casual observer, is a straightforward enterprise with clearly obtainable business information, not to mention a very slick Web site. However, the company does or has done business under literally dozens of different names or promotions. Even tracing the links between Trilegiant and Cendant can bog the curious down in a mass of corporate doublespeak. Trilegiant's direct marketing businesses include the aforementioned AutoAdvantage, GreatFun, IdentitySecure, and PrivacyGuard. (For a more complete list of Trilegiant's many aliases, visit ConsumerAffairs.com's Trilegiant complaint page. The PrivacyGuard product is a suite of tools that consumers can ostensibly use to protect their credit, for a "low" monthly debit of $11.99. PrivacyGuard markets its solutions to numerous banks, institutions, and universities, while collecting subscribers' information to share among its many "preferred partners", many of which are also subsidiaries of Cendant. In a properly ironic twist, Trilegiant hired con-man-turned-FBI consultant Frank Abagnale as its spokesman for PrivacyGuard. Trilegiant is billed by Cendant's public relations department as a "successor" to its membership and marketing services, but it is still listed as a subsidiary or "branch" business on the main Cendant Web site. Press reports that discuss the Trilegiant/Cendant relationship variously characterize the companies as corporate parent and spinoff, independent business partners, or full-blown subsidiaries. Cendant itself owns or has holdings in so many companies that it creates a dizzyingly vast web of partnerships to share information with. You can book a flight on Cheaptickets.com, rent your car from Budget, and stay at the Ramada Inn -- all Cendant brands or businesses, and all of which can leave customers open to targeted offers from the Cendant Marketing Group, which includes Progeny Marketing Solutions as well as Trilegiant. In a 2004 press release from Progeny, Cendant reaffirmed its relationship with Trilegiant through "Cendant Marketing Group, a new entity to coordinate the activities of its two direct marketing units." And what does Trilegiant do with your information once it's provided? That's where its "loyalty enhancement" programs come in. Trilegiant takes great pride in its multiple methods of collecting consumer information for marketing and business purposes. Trilegiant's "Loyalty Marketing" division offers third-party solutions for businesses and retailers to build customer loyalty, including their "Discount Shopping" and "Buyer Reward" programs. The company deliberately crafts marketing solutions for differing socioeconomic groups, ranging from the "sub-prime" (low-income) market to the most valuable "super-prime" (wealthy) customers. Interestingly, the company's marketing materials for their product line are exactly the same, making one wonder how it differentiates between customer groups when soliciting for new memberships. Trilegiant's many partners include the major players in the credit and finance industry, such as J.P. Morgan Chase. Chase Bank prominently advertises several Trilegiant companies as "preferred services", including AutoAdvantage, ShoppersAdvantage and TravelersAdvantage. In much smaller type at the bottom of each page, Chase states that "Chase Manhattan Bank USA, N.A. is not affiliated with or responsible for Shoppers Advantage or Trilegiant Corporation." Each of these membership clubs offers a two-month $1 trial of its services, after which the user will be billed at an annual rate of $89.99 unless they call in and cancel the service during the trial period. However, direct mail solicitations from Chase did not explicitly state these terms. Instead, Chase customers received checks as "rewards" for their loyalty in the mail, along with solicitations for Trilegiant's discount services. Cashing the checks would automatically sign them up for a regular membership with these companies unless they called to cancel the membership within 30 days - none of which was very prominently explained in the direct mail solicitation. This same principle was applied to Trilegiant's partnership with the Experian credit reporting agency. Formed in 2002, Experian and its subsidiary company, ConsumerInfo.com agreed to share their credit reports, for use with Trilegiant's PrivacyGuard product, as well as "maintenance and hosting of all credit-related Web sites for Trilegiant." ConsumerInfo.com's sites, such as FreeCreditReport.com, are notorious for advertising "free" trials of services, only to bill buyers at a regular rate each month unless they call and cancel. Trilegiant's most audacious gambit involved combining an airplane security solution with gathering market information. In 2003, the Department of Homeland Security (DHS) came under intense scrutiny for its proposed "Computer-Assisted Passenger Pre-Screening System", or CAPPS II. The system was criticized for collecting an exhaustive amount of information on potential airline passengers via computerized reservation systems (CRS), which could then be stored or sold without any restriction. The CRS system designed as the backbone of CAPPS II came from a company called Galileo International, a subsidiary company of - you guessed it - Cendant, and partner to Trilegiant. As privacy advocate Bill Scannell put it, "Galileo can sell or trade your dossier to whomever they wish," with the leading candidates being Cendant's many travel-related enterprises. After a massive public outcry, DHS scrapped the CAPPS II program, but has since pushed to implement a similar initiative called "Secured Flight." As for Galileo, it recently renewed a partnership contract with World Travel Service to provide, as the press release puts it, "development of technology solutions and vendor relationships essential to our success." Where, it must be asked, does the consumer fit into this tangled web of "vendor relationships?" On July 12th, California's Attorney General, Bill Lockyer, filed suit against Chase Bank and Trilegiant for their "deceptive billing practices" relating to the bundled offers to Chase customers. Lockyer accused the companies of preying on the elderly and customers with limited grasp of English, in order to continue their "unsavory schemes." About the same time, after 500 complaints to their office and a reputed two-year investigation (plus nearly 2000 complaints to the Connecticut Better Business Bureau), Connecticut's own Attorney General, Richard Blumenthal, announced his office was launching its own lawsuit against the corporation in conjunction with the state's Department of Consumer Protection. "Trilegiant uses 'Advantage' to name its clubs but the only real advantage goes to Trilegiant," Blumenthal said. "My office has intervened on behalf of hundreds of consumers, but Trilegiant persisted in its predatory enrollment practices over and over again. We're investigating involvement of other companies credit card issuers and national banks that may be knowingly aiding this scheme." Trilegiant had already paid $400,000 to the state of Florida in March of 2005 to settle similar claims out of court, but its legal woes may be just beginning. Several law firms say they are compiling evidence to be used in class action lawsuits. In a perhaps-not-unrelated development, Cendant has indicated that it plans to sell its marketing division (which handles Trilegiant and its "sibling", Progeny) "in order to focus on travel and real estate." Skeptics say this sounds similar to the many government and corporate executives who find themselves in dicey situations, then promptly resign to "spend more time with their families." Whatever the true state of affairs, it would appear that Trilegiant's "loyalty solutions" do not extend to maintaining its troubled relationship with its corporate parent. If the complex house of cards begins to wobble, there'll be few tears shed by consumers. As one ConsumerAffairs.com complainant put it: "[This is] a huge annoyance and [possible]credit card fraud. I want this corporation stopped. How many more people like me are out there and don't know that they are being scammed?" One of every 200 registered 1999 Acura Integras was stolen last year, making it the most stolen car in America. Integras from model years 1995 through 1998 took four of the other top 9 positions on the list. The 1994, 2000 and 2001 Integra models also make the top 20 list. The list ranks vehicles by the percentage of registered vehicles stolen, rather than by gross number of thefts. The popularity of different Integra models with thieves made Acura the most stolen make of 2004, followed by Hummer, Land Rover, Daewoo and Honda. The top three vehicle segments with the highest rate of theft rates in 2004 were the full-size sport/utility Vehicles, such as the Cadillac Escalade; the upper midsize sedans, including the Integra; and the prestige luxury segment, such as Bentley and Mercedes Benz. The top 10 list is rounded out by the 1991 GMC V2500 at No. 4, the 2002 Audi S4 at No. 5 and the 1992 Mercedes-Benz 600 at No. 10. The theft data comes from CCC Information Services which tracks auto theft claims. The experts think that a growing interest in street racing could be feeding the thieves demand for the Integra. The reason could also explain why the 2002 BMW M Roadster is the No. 2 car on the list, as well as why the 2004 Mercury Marauder comes in at No. 8. "We cannot determine with absolute certainty the reason why thieves steal some vehicles over others, but we see trends in the data that provide interesting insight," said Carole Comstock, CCC's vice president of marketing and product management. "For instance, our data suggests some cars are stolen for the value of their parts, which may explain why we often see a 'clustering' effect with same make and model vehicles from sequential model years." The Internal Revenue Service has revoked the tax-exempt status of four credit counseling groups and is continuing its investigation of several others accused of abusing their tax-exempt status, a senior IRS attorney said. She did not identify the organizations affected. IRS attorney Debra Kawecki addressed members of the Association of Independent Consumer Credit Counseling Agencies, which held its annual meeting in Washington last week. According to the IRS Web site, A Better Way Credit Counseling of Greenacres, Fla., and the National Center for Debt Elimination of North Huntingdon, Pa., no longer qualify to receive tax-deductible contributions, the Baltimore Sun reported. AmeriDebt, once a major credit counseling agency, is being liquidated in bankruptcy court and its founder, Andris Pukke, is being sued for $172 million by the Federal Trade Commission. Kawecki was challenged by a lawyer who represents credit counseling firms. David Borinsky said the IRS should issue rules to give the agencies more guidance. But Kawecki shot back that credit counseling is not rocket science and said rules weren't needed. "It's basic bread-and-butter tax-exempt law ... You help people, you don't hurt people," she said, according to The Washington Post. Credit counseling became a growth industry in the 1990s, as scores of supposedly not-for-profit organizations were created, each claiming to help consumers manage their debt. But consumers and investigators say many of the agencies charged high fees, funneled money to for-profit affiliates and didn't provide the consumer education they promised. The crackdown has taken on added urgency because of the new bankruptcy law which goes into effect in October. It requires that consumers undergo credit counseling with a government-approved not-for-profit before filing for bankruptcy. The IRS has reportedly received about 40 applications from agencies hoping to qualify for tax-exempt status and so far has notified about half that they don't appear to qualify, a senior IRS attorney told a conference of credit counseling organizations. Consumer advocates have criticized the IRS for being too lenient in granting tax-exempt status to credit counselors. In April, IRS Commissioner Mark W. Everson told a Senate committee that the IRS identified 60 credit counselors for examination. He added that the IRS revoked or proposed to revoke the tax-exempt status of counselors representing more than 20 percent of the industry's gross receipts. The Federal Trade Commission has filed a federal district court complaint charging the promoters of the popular dietary supplement Xenadrine EFX with making misleading weight loss claims. Xenadrine EFX contains, among other ingredients, green tea extract, yerba mate, and bitter orange. A 120-tablet bottle a one-month supply retails for approximately $40. Since its introduction in 2002, Xenadrine EFXs sales have topped $160 million. According to the FTC, promoters advertised Xenadrine EFX heavily in print and on TV, including in such publications as People, TV Guide, Cosmopolitan, Glamour, Lets Live, Mens Fitness, and Womens World. They also disseminated Spanish language ads for Xenadrine EFX. The advertisements claimed that Xenadrine EFX causes rapid and substantial weight and fat loss, such weight loss without the need to diet or exercise, permanent or long-term weight loss, and is clinically proven to work. The ads relied heavily on testimonials from supposedly satisfied customers, some of whom claimed to have lost over 100 pounds. The complaint names Robert Chinery, Jr., Tracy Chinery, and their company, RTC Research & Development, LLC, alleging that the New Jersey-based Chinery defendants made false and unsubstantiated claims for Xenadrine EFX, including that it was clinically proven to cause rapid and substantial weight loss and clinically proven to be more effective than leading ephedrine-based diet products. According to the complaint, Robert Chinery commissioned several studies of Xenadrine EFX, none of which showed substantial weight loss. The complaint alleges that in one of these studies, subjects taking Xenadrine EFX lost an average of only 1.5 pounds over the 10-week study, while a control group taking a placebo lost an average of 2.5 pounds over the same period. In addition, the Commission has accepted a consent agreement with another group of entities, Cytodyne, LLC, Evergood Products Corp., and Melvin Rich, all of New York. They have entered into an administrative settlement with the FTC. The consent order requires the respondents to pay $100,000 to the FTC. It also prohibits the Rich respondents from claiming that Xenadrine EFX or any other substantially similar product causes rapid and substantial weight or fat loss and prohibits the claim that any weight-loss product causes rapid and substantial weight loss without diet or exercise. The settlement further prohibits the respondents from claiming that any weight-loss product, dietary supplement, food, drug, or device causes weight or fat loss, causes permanent or long-term weight loss, or causes users to lose weight or fat without diet or exercise unless they have competent and reliable scientific evidence to substantiate the claims. It also requires that the respondents have competent and reliable scientific evidence for any claims they make about the health benefits, performance, efficacy, safety, or side effects of any such product and prohibits them from misrepresenting any test, study, or research for any such product. In addition, the settlement prohibits the respondents from misrepresenting the experience described in any user testimonials for any weight loss product, dietary supplement, food, drug or device. It requires the respondents to disclose any material connection including monetary payments between the endorser and the respondents or any person or entity involved in manufacturing, marketing, or selling the product. Teenage boys who drink carbonated or non-carbonated soft drinks consume an average of three 12-ounce cans per day, and girls more than two cans, according to a new analysis of 1999-2002 government data. Teens who drink soft drinks get nearly 15 percent of their total calories from those drinks. Although adults seem to be turning to diet drinks, the Center for Science in the Public Interest (CSPI) says that the data show teenagers are actually consuming more high-calorie soft drinks than ever -- and fewer diet drinks than in years past -- despite growing concerns about obesity. "Just as the soaring rates of obesity have shocked Americans, so should the increasing consumption by teenagers of one of the causes of obesity," CSPI executive director Michael F. Jacobson said. "What was once a rare treat in a small serving is now served up morning, noon, and night, virtually everywhere Americans happen to be. How did a solution of high-fructose corn syrup, water, and artificial flavors come to be the default beverage?"  The U.S. Government recommends that you drink less (non-diet) soda to help prevent weight gain, tooth decay, and other health problems.  To help protect your waistline and your teeth, consider drinking diet sodas or water.  Drinking soft drinks instead of milk or calcium-fortified beverages may increase your risk of brittle bones (osteoporosis). CSPI also said that caffeinated drinks should bear a notice that reads "This drink contains x grams of caffeine, which is a mildly addictive stimulant drug. Not appropriate for children." "It is obvious to physicians who treat obese children that the extra 200, 300, or 400 empty calories kids get from soft drinks contribute to weight gain," said Dr. Caroline M. Apovian, director of the Nutrition and Weight Management Center at Boston Medical Center. "If you want to stop the epidemic of childhood obesity, curbing soda consumption is the place to start. Health messages on labels would certainly help parents and teens be aware of the risks." In 2004, soft drink companies produced 37 gallons of carbonated non-diet soda-providing about 60,000 empty calories-for every man, woman, and child in the United States, according to Liquid Candy, a CSPI report first issued in 1998 and just re-released in updated form. As high as that is, industry data show that per capita production of carbonated soda has dropped 7 percent since 1998. And because many adults have switched to diet soda, production of non-diet soda has declined 12 percent-the biggest decrease ever. Nevertheless, despite that decline in overall production, soda consumption in kids has increased from the 1970s to the 2000s, as have their rates of obesity. Obesity has doubled in kids, and tripled in teens. Though the correlation is striking, recent studies have provided even more direct evidence implicating increased soda consumption with weight gain. CSPI's new data show that one out of every 10 boys consumes 66 ounces-equivalent to five and a half 12-ounce cans, or about 800 calories-per day. One out of every 20 boys consumes the equivalent of 7 cans per day, or about 1,000 calories. The amount of refined sugars that soda-drinking teens get from soda exceeds the government's recommendations for their sugar consumption from all foods. "Soda is bad not only for what is provides kids, but for what it takes away," said Lucy Nolan, executive director of End Hunger Connecticut!. That group recently lobbied successfully for legislation banning soda and other junk foods from schools only to see it vetoed by Governor Jodi Rell. "Hardly any kids are getting enough calcium, vitamins, fiber, vegetables, or fruit. The more soda you drink, the less of those you get. If school systems spent half as much time trying to get more fruits and vegetables into schools as they did trying to keep soda contracts, our kids would be much better off." Overweight or obese teens are increasingly at risk for type-2 diabetes, once called "adult-onset" diabetes and once rare in kids. And the decreased calcium intake that may accompany increased soda consumption can put people, particularly women, at greater risk for broken bones and osteoporosis. CSPI's petition is supported by groups including the American Dental Hygienists Association, the American Society of Bariatric Surgeons, the Consumer Federation of America and the National Center for Health Education. It is also supported by leading scientists and nutrition experts, including Gladys Block of the University of California, Berkeley, School of Public Health; George Bray of the Pennington Biomedical Research Center at Louisiana State University; Brian Burt of the University of Michigan School of Public Health; JoAnn Manson of Harvard Medical School; and Marion Nestle of New York University. Besides health messages on labels, CSPI recommends requiring calorie labeling of beverages on chain restaurant menus and menu boards, and stopping soda sales in schools. CSPI also says that states and local governments that levy small taxes on soda or other junk foods should consider earmarking those revenues for promoting health and fitness. A national 2-cent-per-can tax on soda would raise $3 billion annually-almost one thousand times as much money as the federal government spends promoting consumption of fruits and vegetables. A study of of Australian drivers reports that the use of any cell phone, hands-free or otherwise, carries a four-fold higher risk of serious accidents. It's the latest in an accumulating body of evidence that finds cell phone user a major factor in highway accidents. The study was conducted in Australia because American cell phone carriers refused to cooperate. The Insurance Institute for Highway Safety study, "Role of cellular phones in motor vehicle crashes resulting in hospital attendance," was published in the British Medical Journal. "The main finding of a fourfold increase in injury crash risk was consistent across groups of drivers," said Anne McCartt, Institute vice president for research and an author of the study. "Male and female drivers experienced about the same increase in risk from using a phone. So did drivers older and younger than 30 and drivers using hand-held and hands-free phones." Weather wasn't a factor in the crashes, almost 75 percent of which occurred in clear conditions. Eighty-nine percent of the crashes involved other vehicles. More than half of the injured drivers reported that their crashes occurred within 10 minutes of the start of the trip. The study was conducted in the Western Australian city of Perth. The Institute first tried to conduct this research in the United States, but U.S. phone companies were unwilling to make customers' billing records available, even with permission from the drivers. Phone records could be obtained in Australia, and the researchers got a high rate of cooperation among drivers who had been in crashes. Another reason for conducting the study in Australia was to estimate crash risk in a jurisdiction where hand-held phone use is banned. It has been illegal while driving in Western Australia since July 2001. Still one-third of the drivers said their calls had been placed on hand-held phones. The results suggest that banning hand-held phone use won't necessarily enhance safety if drivers simply switch to hands-free phones. Injury crash risk didn't differ from one type of reported phone use to the other. "This isn't intuitive. You'd think using a hands-free phone would be less distracting, so it wouldn't increase crash risk as much as using a hand-held phone. But we found that either phone type increased the risk," McCartt says. "This could be because the so-called hands-free phones that are in common use today aren't really hands-free. We didn't have sufficient data to compare the different types of hands-free phones, such as those that are fully voice activated." The findings of the Institute study, based on the experience of about 500 drivers, are consistent with 1997 research that showed phone use was associated with a fourfold increase in the risk of a property damage crash. This Canadian study also used cell phone billing records to establish the increase in risk. The Institute's new study is the second to use phone records and the first to estimate whether and how much phone use increases the risk of an injury crash. Taken together, the two studies confirm that the distractions associated with phone use contribute significantly to crashes. Other studies have been published about cell phone use while driving, but most have been small-scale and have involved simulated or instrumented driving, not the actual experience of drivers on the road. When researchers have tried to assess the effects of phone use on real-world crashes, they usually have relied on police reports for information. But such reports aren't reliable because, without witnesses, police cannot determine whether a crash-involved driver was using a phone. State officials are responding sharply to a study that suggests doctors are victims of price-gouging by insurance companies who continue to raise malpractice insurance premiums even as claims decline. The data in the Annual Statements filed under oath with state insurance departments, which this Report discloses, call into question much of what the medical malpractice insurance industry has been saying publicly during the past several years, said Missouri Attorney General Jay Nixon. There is no excuse for malpractice insurers doubling their rates while their claims payments decrease. According to the study, released by the Consumer Federation of America, Public Citizens Congress Watch and U.S. PIRG, medical malpractice insurance rates for doctors have skyrocketed in recent years even though claim payments are down. The numbers underscore the need for much tougher, more aggressive oversight to prevent and punish profiteering, Connecticut Attorney General Richard Blumenthal said. Federal and state regulators should thoroughly scrutinize recent rate increases and take appropriate corrective action. Affordable medical malpractice insurance is critical to public health. Expensive insurance rates become a matter of life and death when they drive doctors out of business - as is happening in Connecticut and nationwide. Insurance company greed can be hazardous to our health. Michigan Office of Financial and Insurance Services Commissioner Linda A. Watters said she was "definitely disturbed" by the numbers in the report, which offers "evidence that doctors may be paying excessive premiums." "In the market competition study that we recently issued, we considered loss ratios below 50 percent as patently excessive. If these carriers truly have loss ratios that that are this low and yet they are still increasing rates, one has to wonder if they're gouging, Watters said. Although there are no differences in clinical outcome, the in-hospital cost of coronary bypass surgery in the U.S. is 82.5 percent higher in the U.S. than in Canada, according to a study in the July 11 issue of Archives of Internal Medicine. Cardiovascular disease is a leading cause of illness and death in the U.S. and Canada, with an estimated direct cost in the U.S. of $209.3 billion in 2003, including $94.1 billion in in-hospital costs alone. In 2000, more than 500,000 bypass procedures were performed in the U.S.
Mark J. Eisenberg, M.D., M.P.H., of Jewish General Hospital, Montreal, and colleagues compared the outcomes and costs of treatment of 12,017 consecutive patients (4,698 U.S. and 7,319 Canadian patients) undergoing CABG at five U.S. and four Canadian hospitals. "In-hospital costs of treatment were substantially higher in the United States than in Canada [an average cost of $20,673 vs. $10,373]," the authors report. "After controlling for demographic and clinical differences, length of stay in Canada was 16.8 percent longer than in the United States; there was no difference in in-hospital mortality; and the cost in the United States was 82.5 percent higher than in Canada." "Coronary artery bypass graft (CABG) surgery requires substantial resources in Canada and the United States," the authors conclude. "However, patients undergoing CABG at U.S. hospitals incur approximately twice as much cost compared with those at Canadian hospitals, with little difference in clinical outcome and despite shorter average LOS [length of stay]. The difference in total in-hospital costs is almost equally attributable to differences in direct and overhead costs between the Canadian and U.S. hospitals. This cost differential primarily reflects higher resource prices for products and labor and higher overhead costs in the United States resulting from a nonsocialized medical system. However, U.S. hospitals also appear to streamline services better to reduce LOS, a strategy Canadian hospitals might emulate to further reduce treatment costs." The Food and Drug Administration has issued a nationwide warning to consumers against drinking unpasteurized orange juice products distributed under a variety of brand names by Orchid Island Juice Company of Fort Pierce, Florida, because they have the potential to be contaminated with Salmonella Typhimurium and have been associated with an outbreak of human disease caused by this organism. Salmonella Typhimurium is a germ that can cause serious and sometimes fatal infections in young children, frail or elderly people, and others with weakened immune systems. Otherwise healthy individuals may suffer short-term symptoms such as high fever, severe headache, vomiting, nausea, abdominal pain and diarrhea. Long- term complications can include severe arthritis. To date there have been reports of 15 cases of a matching strain of illness directly linked to a history of consumption of Orchid Island Juice from mid-May to June in Michigan, Ohio and Massachusetts. In addition, at least 16 other states have reported cases of Salmonella Typhimurium infection that match this specific strain. Further investigations are underway to determine if these infections are also related to these products or not. "FDA is working with the U.S. Centers for Disease Control and Prevention (CDC) and our state partners to identify the source of the problem and its scope," said Dr. Robert Brackett, Director of the FDA's Center for Food Safety and Applied Nutrition. "It is important to note, however, that the vast majority of orange juice sold in stores is pasteurized and safe to drink." The unpasteurized product comes in a variety of containers distributed to retail stores and restaurants under various brand names. The products are identified on the labels as freshly squeezed or fresh orange juice. The following labels are involved: Nino Salvaggio's, Westborn Market, and Natalie's Orchid Island Juice. Orchid Island Juice bottles products under other brand names that have not yet been provided to FDA by the company. The FDA says these products do not bear a warning label that the juice is unpasteurized. Such warning labels do appear on many unpasteurized juice products, so consumers should not assume these products are safe to consume simply because they do not bear the "unpasteurized" warning label. Individuals who believe they have become ill as a result of drinking this un-pasteurized juice should consult their health care provider and contact their local health department. Al Gore took a lot of heat for his slightly inflated version of his role in the Internet's beginnings but, whatever else you may say about it, the previous Administration at least appeared to be trying to jump-start the Internet. The current masters of the universe seem to think the "invisible hand of the marketplace" will cause broadband to sprout like kudzu throughout the land, without (or in spite of) needless interference from government. The Federal Communications Commission, accordingly, stood aside as the Bell companies devoured everything in sight, pausing between gulps to say that new broadband networks would be coming soon. But while high-speed Internet use by U.S. businesses and households rose 34 percent in 2004 to 37.9 million lines, according to FCC figures released last week, the U.S. ranks 16th in broadband use among major nations. Digital subscriber line, or DSL, service increased 45 percent last year to 13.8 million lines. Cable modem use climbed 30 percent to 21.4 million lines. Other Internet connections using wireless and satellite increased by 50 percent to 500,000 last year, the FCC said, while use of optical fiber and powerlines rose 16 percent to 700,000. In a column published in Thursday's Wall Street Journal, FCC Chairman Kevin Martin vows that broadband deployment is his "highest priority." Perhaps, but that's not of much comfort to the millions of Americans still without broadband service -- not all of them in Short Pump, Virginia, or Happy, Texas. Some are in "undesirable" big-city neighborhoods, others in affluent suburbs that for one reason or another aren't wired for DSL or cable and some are just in-between, traveling, vacationing or working outside the office. The United States is a pretty big place, after all, and the natural inclination of any businessperson is to concentrate his service where it will reach the biggest number of potential customers with the lowest possible delivery costs. These days, that generally means that downtown areas and middle-class neighborhoods are the most likely to have broadband service from either a cable company or the local telephone company, or, as is often the case, both. And everyone else? Well, they are mostly out of luck. There's no doubt things are changing and new services are coming. Verizon and SBC are digging up streets throughout the land to install fiber to the home so that they can compete with cable system by delivering high-definition video. Of course, almost all of this activity is in areas where cable and the telcos already provide broadband. It does nothing for those in unserved areas. While there is no shortage of complaints about DSL and cable Internet services, the situation is much worse for those who can't get broadband at all. "The Internet is increasingly designed to be used with a high speed connection," said Mark Huffman, a ConsumerAffairs.com contributing editor who moved to a rural area on Chesapeake Bay a few years ago. "Every site is loaded with rich media. If you are on dial-up, its very hard to use the Internet. It becomes very frustrating." Working with Huffman, we explored various methods of getting broadband service where none now exists. Contrary to what broadband providers might think, Huffman found a great deal of interest among residents of his somewhat sleepy village. "In my county there is no broadband available, other than satellite. I can tell you that every business owner I talked to about trying to bring in wireless was enthusiastic about the idea, and willing to pay a premium price to get it, if they could," Huffman said. We found this expensive ($80 per month) service to be virtually useless, whether in the sticks or under the Capitol dome. We could not get it to work in the Washington, D.C., New York or Los Angeles metro areas. It didn't work in the St. Louis airport or at the beach in Delaware, to pick a few other examples. Where does this thing work, we wondered? Answer: we don't know. See A Test of Verizon Wireless Broadband for all the gory details. Warning: Sprint has announced it is deploying the same technology. Buyer beware. Unlike the Verizon wireless card, some wireless broadband providers offer what's called "fixed wireless" -- meaning it's not mobile. This involves line-of-sight microwave transmission. Translation: towers. If you are lucky enough to have such a service in your area, it may be the answer if you are in its primary coverage area and don't have trees, mountains or other obstructions blocking the signal path. It can work well, we're told. We were not able to find any services we could test but we heard from one consumer who's quite happy with her experience. "We had satellite-based Starband, but found it slow and stupid about multiple users," said Catherine of Sparks, Nevada. "So we got wireless broadband from Amigo and we are very happy with it." "The thing is that we essentially have a personal ISP -- the guy who runs our area for Amigo.net knows us, our tech needs and is very responsive (unlike our prior DSL experience elsewhere with Verizon). Reminds me of when we used to have our power from a rural electric coop -- a much friendlier experience!" A T-1 is old technology but very stable. It is provided over a double pair of plain old copper telephone lines and is available literally anywhere in the U.S., if you're willing to pay for it. Line-haul charges are steep outside major urban areas. The speed is about the same as an average cable connection. Installation takes months and a long-term contract is required. A few years ago, driven nearly mad by Cox Communications' extremely sporadic service and unable to get DSL in our neighborhood, we had a T-1 installed at our home by a D.C. telecommunications provider who asks not to be named (hey, we have enemies). The cost: $600 per month. This may sound like an extravagance but we work at home quite a bit of the time and reliability is essential. Obviously, a T-1 is impractical for consumers and, in many cases, even for technology-dependent businesses, as we learned when we tried to price out a T-1 for Huffman. We shopped around for a T-1 and found nothing under about $800 per month. We were dubious of that quote since every other provider wanted about $1,200. This obviously isn't a practical solution for most individuals or small businesses. Still trying to get Huffman up and running, we surfed over to DirecTV and found them offering a variety of consumer- and business-grade packages under their DirecWay brand. This is not the old satellite Internet that used a satellite for the downleg and a telephone connection for the upleg -- some pretty cool spread-spectrum technology handles the upleg. The business-grade package we bought delivers speeds comparable to DSL. There was a $1,000 installation charge and the monthly charge is about $99. For a business, this is cheap. Consumer-grade packages start at around $50. Don't say we told you this but you can buy the consumer package and get a geekish friend to put up a Wi-Fi connection that your neighbors can use. Maybe you can get them to chip in on the installation and monthly tariff. At the moment, DirecTV has the market pretty well to itself although there is a new player that hopes to make some noise later this year, we're told. In the past, we have received some really bitter complaints from consumers who found various satellite Internet services annoying. There's no question that wireless communications will almost always be somewhat less stable than wired; it's the nature of the beast. Satellite transmissions are in the Ku band -- very high frequency and thus more prone to interference from rain and snow. Until the laws of physics are changed, you can expect service degradation during bad weather. Then there's the little matter of the speed of light. The communications satellites are 26,000 miles out in space. A signal has to go up from your dish to the bird and the downleg signal has to come back down. That's 52,000 miles round trip. Look up the speed of light and you can do the math; it works out to a noticeable split-second delay between the time you click your mouse and the time the signal hits the router on the bird. Is this a problem? We'd say that once you understand what's happening, you can make a mental adjustment to allow for it. We have been around satellite communications a long time and respect it greatly. It is amazingly effective and has the lowest environmental overhead you can imagine -- no wires, no digging, no towers, very slight power consumption. OK, some might find the dishes ugly but that's an aesthetics argument. Personally, we find utility poles about as ugly as anything. Dangerous, too. We spent an afternoon using the DirecWay feed and found it as good if not better than the T-1's we use at our office and at home. Of course, not every DirecWay customer agrees, including Gary of Lincoln, Missouri. "Service is very crappy. Slow, sometimes as bad as dialup if not worse. I buy and sell on ebay so if the internet doesn't work I lose big," Gary said. Gary's complaint is similar to those often leveled at DSL and cable providers as well. In many of these cases, the fault lies elsewhere -- slow servers, bogged-down DNS and, not infrequently, balkiness in the user's PC. Inadequate memory, spyware, viruses, file fragmentation, all can slow the display of Web pages. It's a little puzzling why broadband Internet via electrical lines hasn't taken off. The copper wires that deliver electricity to homes and offices are capable of moving a lot of data at very low cost but the technology just hasn't gotten the attention it would seem to deserve. That may be changing, though. A Maryland company that provides high-speed Internet access over electrical power lines last week received a major investment from Google Inc., the Hearst Corp. and Goldman Sachs. Current Communications Group declined to disclose financial terms of the investment though the Wall Street Journal reported that it approached $100 million. If the FCC stays out of the picture, maybe this will go somewhere. There's no question: dial-up just doesn't get it anymore. Even if you never download audio or video files, most Web sites now have such fat pages that it's a very frustrating proposition to be stuck on a dial-up connection. The experience just isn't the same. That being said, we would have to admit we sometimes get more done on the rare occasions when we must rely on dial-up connections. We find ourselves spending more time writing and editing, even thinking, less time reading the latest inflammatory e-mails. Then there's the matter of cost: dial-up is cheap, assuming you don't fall for the high-priced brands like AOL, MSN and Earthlink. We seldom issue outright recommendations but here are two dial-up ISP providers we have used with great success when stuck in nowheresville: localnet.com and highstream.net. Both have plans under $10 per month that will provide dial-up access from most parts of the country. As always, you must be sure to select a dial-up number that is within your local calling area. So, what to do if you're living in an area without cable or DSL broadband? We'd say satellite is the best option, at least for now. For road warriors and those on temporary assignments, we don't have a good answer, other than an inexpensive dial-up plan, a list of hotel chains that offer free high-speed access and a willingness to hang around Internet cafes. It shouldn't be that way, but it is. At least for now. In a surprising move, Canadian health authorities are moving towards approving the resumption of Vioxx sales. The prescription pain killer was removed from the market in September 2004 over concerns of heightened risks of heart attacks and strokes among those who have taken it for extended periods. But an advisory panel to Health Canada, the Canadian counterpart to the U.S. Food and Drug Administration, said the risk of heart disease from Vioxx appears to be the same as that posed by other similar painkillers, and that gastrointestinal risks appear to be less. The advisory group also recommended that Celebrex, a COX-2 drug made by Pfizer, Inc., be allowed to remain on the market, but that Pfizer's Bextra, another arthritis drug, be kept off the market. "We welcome the panel's report and I'd like to thank the public for its contribution," Canadian Health Minister Ujjal Dosanjh said. "This is the first time that the Canadian public has been invited to participate in a Health Canada expert advisory panel. Health Canada supports the direction of the Panel's recommendations." Health Canada said it will immediately implement many of the panel's recommendations and will work with its partners to see what further action should be taken. The agency said it acknowledges the panel's view that, as a group, selective COX-2 inhibitors are associated with an increased risk of cardiovascular events, a risk that is similar to those associated with most non-steroidal anti-inflammatory drugs (NSAIDs), a category that includes other COX-2 drugs as well as ibuprofen and other popular pain relievers. The panel noted that this risk is present for all patients taking anti-inflammatory agents and that it increases with longer-term use and when other risk factors, such as cardiovascular disease, are present. In the case of Vioxx, which is not currently authorized for sale in Canada, the panel reported that available data justifies the marketing of Vioxx in Canada because the risk of cardiovascular incidents from Vioxx appears to be similar to that of most NSAIDs. In order for VIOXX to be marketed in Canada, the manufacturer is required to submit a new drug submission to Health Canada. The submission would be reviewed to ensure it meets safety data requirements, with particular attention to the safe labeling issues raised by the panel. The panel, which met June 9-10, 2005 in Ottawa, was created by Health Canada to provide input and advice on the safety of COX-2 NSAIDs and was one part of an extensive review and study of research related to the safety of these drugs. Merck Pharmaceuticals, the maker of Vioxx, had no immediate comment on its Website about the Health Canada recommendation. In the U.S., the FDA continues to study the risks associated with COX-2 drugs. Combi USA, Inc. is recalling its "Avatar Model 8100" child safety seats. The recall involves the entire production of this model from November 2003 through May 2004, the National Highway Traffic Safety Administration (NHTSA) said. As part of a new system for child seat installation, newly manufactured child safety seats must include attachments that fasten to permanent anchors in a vehicles back seat, located where the cushions meet. This system is known as "LATCH" (Lower Anchors and Tethers for Children). In the case of the Avatar seats being recalled, the lower attachment straps fail to meet the requirements of Federal Motor Vehicle Safety Standard No. 213 for child restraint systems. If the child seat is attached using the LATCH system and a crash occurs, the attachment straps could detach from the vehicles lower anchors - possibly resulting in a serious or even fatal injury to the child. Registered owners of these child safety seats will automatically receive a repair kit along with repair instructions in the mail. Those not registered need to request the kit from the manufacturer. Until the latch belt assembly is replaced, Combi USA advises owners to use the seat only with the vehicles safety belts and not with the LATCH system. Owners who do not receive the free kit within a reasonable time should contact Combi USA toll free at 800-992-6624 or visit Combis website at www.combi-intl.com. Consumers with questions about this or any other safety recall campaign should call NHTSAs toll free Vehicle Safety Hotline at 888-327-4236 or check NHTSAs website at www.safercar.gov. Sprint says it will start offering high-speed wireless broadband access in dozens of cities this month, expanding to nearly half of the U.S. population by the end of the year. The service -- priced from about $40 to $90 per month -- is similar to that offered by Verizon Wireless. Both are using a technology called EV-DO. Verizon Wireless began offering the service last year and also expects it to reach half of the population by year's end. Both companies claim that EV-DO offers connections at speeds comparable to, or better than, wired Digital Subscriber Line connections nearly anywhere they can get a cell phone signal. EV-DO works through cards that consumers slide into their laptops. Cell phones and personal digital assistants (PDAs) equipped to receive the high-speed service will be offered during the fourth quarter of the year. Sprint said the service will be available this month in parts of Chicago, Dallas, Detroit, Las Vegas and Miami. By the first quarter of next year, the carrier says it will be available in 60 metropolitan areas. Cingular Wireless says it will offer a similar service in 15 to 20 cities by the end of the year. Florida Attorney General Charlie Crist has filed a lawsuit against New Leaf Associates, LLC, and several associated businesses and individuals for their participation in an allegedly phony "debt termination" scheme. The lawsuit alleges that New Leaf and the other civil defendants took in more than $8 million from late 2003 until early this year by claiming they had a legal "administrative process" by which they could completely eliminate credit card and student loan debts for their clients as an alternative to bankruptcy. An investigation conducted by the Attorney General's Economic Crimes Division revealed that New Leaf collected fees starting at almost $4,000 from approximately 2,200 clients who were lured by the promise that not only would their debts disappear but their credit scores would not be damaged. No debts were actually terminated by the program, and numerous consumers suffered financial losses as a result, the state's lawsuit asserts. The Attorney General's Office has received some 185 consumer complaints regarding the New Leaf scam, the highest total for any single complaint subject this year. "Too many consumers are mired in debt and are desperate to find a way out of their financial dilemma," said Crist. "These defendants took advantage of their victims, who were seeking assistance to solve their financial problems. Floridians should always remember that if something sounds too good to be true, it probably is." The defendants are charged with violating Florida's Deceptive and Unfair Trade Practices Act. They could be ordered to pay restitution to their victims and also ordered to pay civil penalties of $10,000 per violation or $15,000 for victims who were disabled or senior citizens, as well as attorney fees and costs. 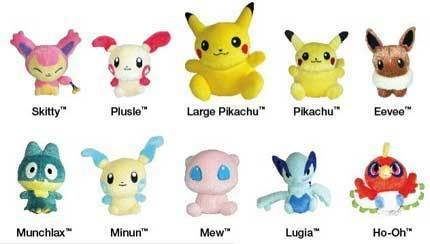 Pokmon Plush Toys are being recalled. The stuffing of the toy may contain tips of sewing needles which could pose a puncture hazard. The recall involves 10 Pokdoll plush toy characters including Pikachu, Minun, Plusle, Skitty, Evee, Munchlax, Mew, Ho-Oh, and Lugia. Pikachu comes in a 12-inch and a 6-inch tall version. All of the other characters are approximately 6-inches tall. They have a sewn-in label that reads: Pokmon Center 2005 Pokmon /Nintendo /Creatures/ GAME FREAK on one side and 2005 MADE IN CHINA on the other. The toys were sold at Nintendo World, 10 Rockefeller Plaza, New York City, and on the firms Web site from April 2005 through June 2005 for between $8 and $20. The PokDoll plush toys were also given away as promotions by Nintendo of America Inc. at the E3 Conference in Los Angeles in May 2005. Parents should take these toys away from children immediately and contact Pokmon USA to receive a free replacement toy. Consumer Contact: For additional information, contact the firm toll-free at (800) 930-6613 anytime or visit Pokmons Web site at www.pokemoncenter.com/recall.asp. Those of us who are addicted to broadband connections at work and at home can go into serious withdrawal when traveling, leading us to grasp at whatever straw holds any hope of providing wireless high-speed when we're on the go. Since last year, Verizon Wireless has offered its version of EV-DO technology, which promises DSL speeds with a wireless connection. Sprint has just announced it is rolling out a similar service using the same technology. When Verizon introduced the service in the Washingotn, D.C., area last year, we were among the first to sign up. It soon had us spitting nails. Next to a certain teenager we once hired to mow our lawn, this is the most shiftless, unreliable service we have ever paid good money for. At about $90 a month, it's far from cheap but we found it to work so poorly it would be overpriced at any price. The theory behind this service is that in some areas, it will pick up a special Verizon EV-DO broadband channel that will deliver speeds of up to 1.5 mbps, which is very fast. If that channel isn't available, it will deliver an ISDN-speed service over the regular cellular network. We ordered the service one day and the very next the FedEx truck wheeled into our driveway in Northern Virginia, delivering the laptop card with collapsing antenna. We plugged it into our laptop, installed the software and everything was great except that we had no bars ... no bars at all. Translation: no signal. We went onto the back deck of our home, which is within a mile of numerous cell towers and held the laptop precariously over the edge of the deck. No signal. The next day, in our Fairfax, Va., office we tried again. We're on the eighth floor of a building that is on one of the highest points in the D.C. area., next to a freeway that has more cell towers than dandelions. We can see the Capitol, the Washington Monument, Dulles Airport, Tysons Corner and we can watch the black helicopters crissing and crossing the area. (Ooops, forget that last part). In this building, we got a strong signal and the Verizon system quickly assigned us an IP address. But we could not surf the Web, do an FTP transmission or send e-mail. We called Verizon tech support and spent quite a bit of time with a very earnest young man who went through every step of the process with us several times, finally admitting he was stumped. "Maybe you could try it outside?" he asked plaintively. We did. Same result. We have repeated the process several times from the same location, with the same results. • Garden City, N.Y. Smack in the middle of Long Island, Garden City is hardly a remote area but a weak signal delivered agonizingly slow speeds for a few minutes at a time before cutting out. Fortunately, our Wi-Fi-equipped laptop easily locked onto neighboring homes' unprotected Wi-Fi networks, no thanks to Verizon. • Bethany Beach, Delaware Our Cingular cell phone gets five bars on the deck of the oceanfront townhouse we rented for a week. The Verizon "Wireless Broadband" card? Same experience as Garden City -- slow, sporadic, useless. Fortunately, by sitting outside, to the delight of every mosquito in town, we picked up one weak Wi-Fi signal which seemed to be coming from the public library down the street. • Long Beach Airport, California Weak, sporadic signal. Fortunately, jetBlue provides free Wi-Fi in its terminal. • Various Other Airports We've lost track. Let's see ... Baltimore-Washington International, St. Louis, Richmond, Dulles. No service. We try hard not to spend much time in airports or the list would be longer. • Falls Church, Virginia To our astonishment, while cooling our heels in a medical building waiting room, we got a strong broadband signal that lasted for all of 20 minutes or so before abruptly disconnecting and refusing all attempts to reconnect. Thereafter, we poached on careless doctors' Wi-Fi feeds. This was the one and only time we have ever gotten any use out of Verizon's "service." Let's see, six months at $90 per month, that's $540. So that 20 minutes of miraculous broadband cost us about $27 per minute, or about $1,620 an hour. Wow, that's even more than Bill Clinton's lawyers charged. Wanting to be fair to Verizon, we tried this not once but twice. We signed up for the service as soon as it became available last year. When it did not work even once during the first 30 days, we sent the card back for a refund. We tried again a few months later -- getting a new card and the latest version of the software, pretty much eliminating the likelihood of an isolated defect. We tried the first card in two different Dell Inspiron laptops. We've been trying to use the second one in a Dell XPS laptop. The XPS stands for "Extreme Performance System" and it is indeed a blazing fast machine with every possible upgrade and up-to-the-minute software patches, upgrades and updates. Anything that does not work on this machine will not work anywhere. Our conclusion? It may be that there are "hot spots" where this service will work but we haven't found them. On the other hand, we've come to realize how ubiquitous unprotected Wi-Fi feeds are. Every hotel and airport we've visited over the last year or so has had Wi-Fi service, nearly always free. Every wide spot in the road now has an "Internet Cafe" where Wi-Fi is available. Even if the Verizon Wireless card worked, I'm no longer sure it would be worth the expense and bother. While you may not want to sit around a coffee shop all day, it beats spending the day fighting with the Verizon Wireless card. And just think how many Chocolate Chip Cookie Dough Frappuccinos that $90 would buy each month. Three Florida men have drawn prison sentences for their part in the sale of fraudulent business opportunities. Steven Mishkin and Martin Geller were the operators of AmeriP.O.S. Inc., which promoted point-of-sale ("P.O.S.") terminal business opportunities. For a minimum purchase price of approximately $12,000, potential purchasers were told they would receive several P.O.S. terminals, and assistance in establishing, maintaining, and operating a P.O.S. terminal business. The defendants falsely claimed that a business opportunity purchaser, known as a "distributor," would earn substantial profits when members of the public purchased products, such as pre-paid debit cards, pre-paid phone cards, and pre-paid Internet services, from the distributor's P.O.S. terminals, prosecutors argued. Mishkin, Geller and others were accused of defrauding over 1,500 consumers, who invested a total of approximately $20 million in AmeriP.O.S. William Judd was charged with engaging in a very similar type of scheme in connection with a firm called Global Resources, Inc. According to the charging document, Global Resources, like AmeriP.O.S., engaged in the sale of business opportunities involving terminals that featured various sorts of pre-paid products. For a minimum purchase price of approximately $14,000, potential purchasers were told they would receive a pre-paid product terminal, along with assistance in establishing, maintaining, and operating a terminal business. According to Global Resources, a business opportunity purchaser, known as a "distributor," would earn substantial profits from commissions generated whenever members of the public purchased products from the distributors' terminals. "These cases are part of a large group of fraudulent business opportunity prosecutions in this District and should serve as a caution to the public," R. Alexander Acosta, United States Attorney for the Southern District of Florida, said. "Just because a business opportunity firm advertises on radio, television, and through the Internet, does not mean that the claims should be trusted by the public." Acosta said his office has filed charges against individuals involved in seven different business opportunity scams. "But prevention of these scams is necessary as well. Consumers need to be vigilant and vet these firms before investing their hard-earned money," he said. Mishkin and Geller were sentenced by United States District Court Judge James I. Cohn in Ft. Lauderdale, Florida. Mishkin, a resident of Hallandale, Florida, was sentenced to 81 months' imprisonment, to be followed by 3 years of supervised release. Geller, a resident of Miami Beach, Florida, was sentenced to 78 months' imprisonment, to be followed by two 2 years of supervised release. Hearings to determine the amounts of restitution Mishkin and Geller owe have been set for August 12, 2005. Judd was sentenced In a separate hearing before United States District Court Judge Patricia A. Seitz in Miami, Florida. Judd, a resident of Hallandale, Florida, was sentenced to seventy 70 months' imprisonment, to be followed by three 3 years of supervised release. He was also ordered to pay $2,316,068.43 in restitution to ninety-five (95) victims. A final restitution determination will be made on September 1, 2005, to allow time for any additional victims to come forth. A series of studies reported in the July issue of Archives of Pediatrics & Adolescent Medicine suggests that the less TV kids watch, the better off they are. In a study of third graders, researchers found that children with a television in their bedrooms had lower scores on standardized tests while kids with access to a home computer had higher scores. U.S. households with children have an average of 2.8 television sets and 97 percent of those households have at least one video cassette recorder (VCR) or DVD player. More than two thirds of households with children have at least one computer and more than half (53 percent) have home Internet access. While substantial evidence exists to show that people who use media more heavily are at greater risk for obesity and aggressive behavior, the relationship between media and academic achievement is less clear, the researchers suggest. "Looking at the media environment in spring 2000, students with a bedroom television scored significantly lower on all the tests compared with their peers without bedroom television sets." the authors write. "Those with home computer access scored higher on all the tests than those without access. When we simultaneously considered bedroom television and/or home computer access, we observed significant differences for each standardized test. Consistently, those with a bedroom television but no home computer access had, on average, the lowest scores and those with home computer access but no bedroom television had the highest scores." In a separate study, researchers from the University of Otago, Dunedin, New Zealand, found that children who watch the most television during childhood and adolescence may be less likely to finish school or go on to earn a university degree. In the study, information about the viewing habits of about 1,000 children was collected at ages five, seven, nine, 11, 13 and 15. Information on the highest level of educational attainment was collected for 980 of the study members (96 percent) at 26 years of age. Childhood television viewing was calculated based on viewing hours per weekday reported at ages five to 11. Adolescent viewing was calculated based on weekday reported viewing at 13 and 15 years of age. "The results of this study indicate that increased time spent watching television during childhood and adolescence was associated with a lower level of educational attainment by early adulthood," the authors write. "These effects were independent of intelligence, family socioeconomic status, and childhood behavioral problems." Researchers from the University of Washington, Seattle, conducting a third study concluded that TV viewing before the age of three may have adverse effects on subsequent cognitive development. Their analysis used data from the National Longitudinal Survey of Youth 1979 Children and Young Adults (NLSY-Child). It involved comparing scores in mathematics, reading recognition and reading comprehension from a commonly used and well-standardized test, with the level of television watching before age three and from ages three to five. "This analysis has shown a consistent pattern of negative associations between television viewing before age three years and adverse cognitive outcomes at ages six and seven years," the authors report. "The inclusion of extensive controls for parental preferences, ability, and investment in their children's cognitive development suggests that these associations may in some direct or indirect way be causal." "By contrast, this analysis suggests that television viewing at ages three to five years has a more beneficial effect, at least for the outcomes of reading recognition and short-term memory," the authors write. The researchers found no beneficial effect on mathematics outcomes or reading comprehension, and they state, "Because reading recognition and short-term memory are arguably the most basic of the cognitive outcomes studied, the implication would seem to be that the net effect of television viewing from a population perspective is limited in its beneficial impact." In conclusion, the authors write, "Television viewing in early childhood varies depending on age; for very young children the effects are negative, while for preschool children they can be constructive, at least in some domains. It was the stock jump heard 'round the world. Before the bell had even rung Friday morning, June 30th, credit card titan MBNA's stock was rising on word that they were about to be "acquired" by the vast Bank of America financial conglomerate. Sure enough, the newswires were abuzz with the deal, at a price of $35 billion in cash and stock, and an estimation of 6,000 jobs to be cut in the merger (Not counting contractors and temporary employees, of course). The buyout culminates a rough half year of business for Wilmington, Delaware-based MBNA. The financial services company was once lauded as a pioneer in the credit card industry, for its "affinity" cards for universities, businesses, and organizations and, later, for its tactic of "universal default" (Increasing credit card fees if the owner is late on any kind of bill payment). After spending millions of dollars in the 2004 Presidential election cycle to ensure the reelection of President George W. Bush and Delaware Senators Joe Biden and Tom Carper, MBNA was rewarded with the passage of the misleadingly-named Bankruptcy Reform and Consumer Protection Act. The measure makes it much harder for debtors to declare bankruptcy, which often happens due to inability to pay off massive credit card balances. MBNA's tireless flogging of the bankruptcy bill and its massive political contributions and prolific hiring of high-level Bush Administration cronies -- turning Wilmington into Washington North -- were supposed to ensure that profits continued to climb. MBNA cardholders, furious over incessant jumps in interest rates, constant tacked-on fees, and questionable customer service, started paying their debts down as fast as they could, and closing out their cards even faster. This development came on the heels of MBNA employees cashing out their early retirement plans in record numbers. The retirement payouts, coupled with the loss of profit from paid-off and closed cards, led MBNA's first-quarter profits to drop by a staggering 94%, down to $31.7 million from their initial projection of $519 million. The profit projections crashed faster than MBNA executives' helicopter did when it plunged into the East River in New York last month. The profit gap, coupled with news that MBNA CEO Bruce Hammonds and other insiders sold off their MBNA stock to the tune of one million shares and profits of $9 million, led angry shareholders to file a class-action lawsuit. The suit, filed by law firm Milberg Weiss, alleges that MBNA overstated profit reports and "[failed] to recognize impairment of [their] assets by adverse interest-rate increasesAs a result of MBNA's improper accounting of its portfolio, MBNA presented materially false financial results." After that, the writing on the wall was plain to see. Bank of America, already the world's third-largest bank after its purchase of the FleetBank corporation, was hungry to acquire MBNA's massive credit operation. The conglomerate will command mind-boggling assets of $143 billion in outstanding credit card balances, and double its customer accounts to 40 million, according to TheStreet.com writer Matthew Goldstein. The Charlotte-based bank claims the deal will make it the biggest credit card issuer in the U.S., surpassing Citigroup and J.P. Morgan Chase. For pundits and proles alike, the buyout was greeted with apprehension for customers' future with the new bank, and for financing in general. In the appropriately modest state of Delaware -- its motto: Small Wonder -- the news was as welcome as a hurricane during summer beach season. "With MBNA being [Delaware's] third largest private employer (10,000-odd jobs, remember, our whole state has under a million people), even if half of the projected 6,000 job cuts take place here, it's going to hurt pretty bad", said one poster on the popular DailyKOS blog. Consumer advocates felt the same way. Consumer Federation of America president Stephen Brobeck said the continued consolidation in the financial services sector could only contribute to climbing interest rates. "This can't but help raise the concern that there will be less competition providing consumers with attractive rates and other (borrowing) conditions," Brobeck said. Writing for the Guardian Unlimited, David Teather stated that "[i]ndependent card companies have struggled of late in the face of competition from bigger banking groups." Bank of America's aggressive merger moves are designed to shore up the company's image after its embarrassing loss of 1.2 million customer data tapes in March 2005. The customers included many military personnel who used Bank of America "Government Cards" for their travel and living expenses, as well as public figures including Senator Patrick Leahy (D-VT). Leahy recently introduced a bill in the Senate that would enact stronger measures for protection against identity theft, cosponsored by Senator Arlen Specter (R-PA). Even as financial analysts and investors circle the bloody waters for the next major corporate consolidation -- Wells Fargo? Capital One? -- many consumers are gleefully enjoying MBNA's fall. One blogger succinctly summed the buyout up by saying "MBNA's profits fell 94% in April. Not that they don't deserve it, but wow! They finally got the predatory [bankruptcy] bill they wrote passed, and now it's backfiring badly."